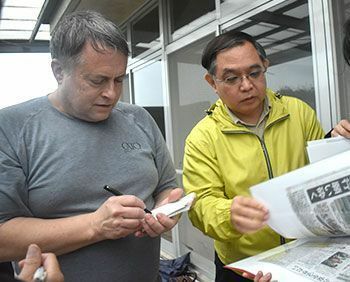 On January 8, Doug Bandow, Senior Fellow at the Cato Institute, a leading U.S. conservative think tank, visited Okinawa International University and Midorigaoka Nursery School in Ginowan, where he observed the situation of the U.S. base burden in Okinawa. Bandow, asked by parents at the nursery school for advice on how to achieve a halt to flights by U.S. military aircraft, said that if the Japanese prime minister tells the U.S. government to move the Marines, the U.S. government will have no choice but to act. He added that if many Japanese citizens get involved, Prime Minister Shinzo Abe will be forced to convey the demand to the U.S. government. Regarding the unceasing problems involving U.S. military aircraft, Bandow said that such problems occur not only in Okinawa, but anywhere that bases are located. He said that with regard to Okinawa, the bases are simply too close to people’s daily lives. At Okinawa International University, Bandow engaged in discussion with Professor Manabu Sato. At Midorigaoka Nursery School, where a cylindrical object appearing to be from a U.S. military aircraft fell from the sky in December of last year, nursery school principal Takehiro Kamiya and parents of the children there told Bandow about what happened at the time the object fell. After observing these sites, Bandow commented that aircraft were constantly flying overhead, saying that this is very unsuitable for the children’s growth and creates a poor environment for local residents.